An engineer turned traveler, Tushar Gagerna is one of the most versatile entrepreneurs we have in India. He completed graduation in electronics and communication engineering from Netaji Subhas Institute of Technology, New Delhi and started his professional journey in 2014. From forecasting stock market to strategizing digital marketing activities, he has done all. Tushar co-founded his dream venture WOOBUS.in with one of his friends Pariskshit Dutt, after realizing the dire need of a well maintained and organized bus service in India. The determination to develop this premium bus service came from a trip to Spiti valley where he traveled to with his friend and discovered pain points of travelers like him. Tushar believes there is nothing like ‘impossible’ in this world. He takes inspiration from everyone around, be it a stranger, a celebrity or a philosopher. When he has time, you can find him doing portrait photography and reading about travel. Learn more about this enthusiastic budding entrepreneur of India. 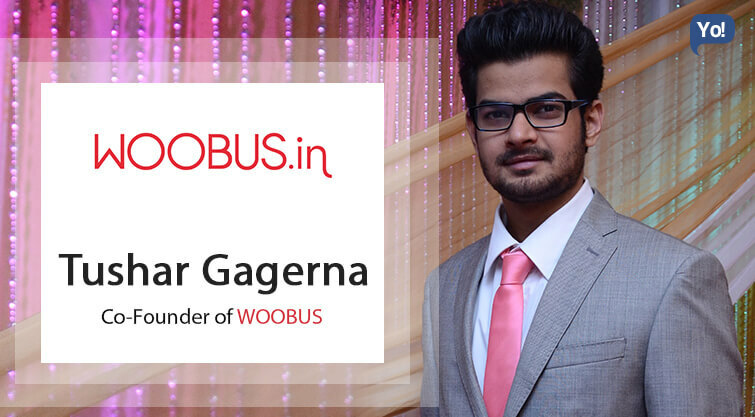 WOOBUS is a chain of Premium Inter-City bus service. We provide plethora of amenities like Free Wifi, Eye Masks, Neck Pillows, Blankets, Trained Staff, etc. We are standardizing the whole bus travelling experience in India. Being frequent travelers ourselves, we realized the pain points while commuting in Luxury buses in India. While returning from Spiti Valley, both the founders took pledge to resolve the issue for other fellow travelers like us in India. If you want something, go get it because ‘limits’ like ‘fears’ are often just an illusion. The Online Ticket Aggregation system built currently works in a primitive fashion and it needs to upgrade with time. Entry barrier is pretty strong if your business model is new to the industry. We figured out alternatives which did not require building the whole thing grounds up and it saved us months of time. Discipline, Persistence and Open Mindset. ‘Trello’ to efficiently allocate and manage the tasks among the team. I have this funny habit of watching motivational videos on Youtube whenever I feel low. My favorite is undoubtedly ‘Les Brown’. Judging too early. Part of my job includes trying to understand what people actually mean or seek which they don’t speak out directly. I realize that I am no Sherlock and often it lands me in troubles. Every morning in Africa, a gazelle wakes up. It knows it must outrun the fastest lion or it will be killed. Every morning in Africa, a lion wakes up. It knows it must run faster than the slowest gazelle, or it will starve. It doesn’t matter whether you’re a lion or gazelle – when the sun comes up, you’d better be running! Being a people pleaser. It might take you to a lot of places but it certainly would keep you away from more important ones. Things take time. No matter how fast you move, there are certain things which will keep pulling you back. Be prepared. I believe my career path has been an amazing journey so far and I certainly would not want anything to change. Spiti Valley, Chail and Triund.